It’s been a week since the Backstreet Boys performed on the Wango Tango stage and they haven’t stopped since. 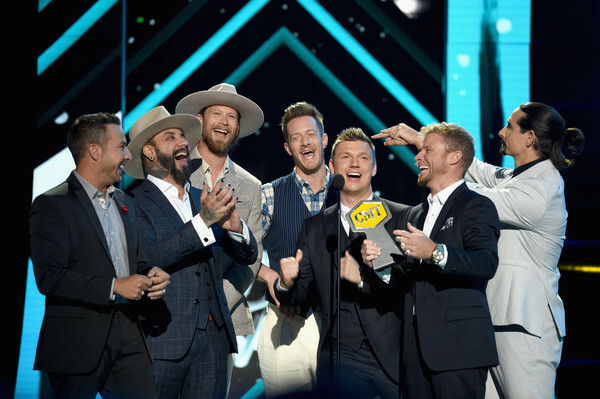 After taking a moment to celebrate his wife Lauren’s birthday in LA, Nick set off to Nashville with the Boys to perform at the CMT Awards, win a CMT Award with Florida Georgia Line for Performance Of The Year, celebrate their first #1 hit on country music radio with “God, Your Mama, And Me”, hit the CMA Fest stage at Nissan Stadium on Sunday night and get some recording done in between. While it may seem like a lot to accomplish in one week, it’s the norm for Nick Carter, who is always working on something. Another thing that stays the norm? How grateful he is for the Backstreet Boys’ success, his family, and of course, the fans. Check out some of the most notable interviews and quotable moments from the last week! On Fans: "We have the best fans in the world. They've been with us through thick and thin, highs and lows..."
On Advice for Gwen Stefani on her new Vegas residency: "Just have fun. It's the biggest stage in the world right now and we're glad she's a part of the family!" On his favorite song on the radio right now: Niall Horan's "On The Loose"
On the Backstreet Boys’ success: "It's a testament to the music. It's been crossing generations and that's all we could have ever wanted." Did you know that Nick also does yoga? Now you do! What part of the past week has been your favorite part? Chat about it in the comments below! All these quotes just shows again, how amazing person Nick really is. He cares about everyone, never forgets and loves his fans. This past week was really emotional to me due to all the things Nick have said! He is so grateful and we can feel it, we can feel his emotions when he’s talking about the boys, about his gratitude regards to his career accomplishments, about his family - especially his son, when he talks about Odin we can see how complete he feels. But I must say he really gets me when he talks about us, his fans. I’m so thankful knowing that our love does reach him and he feels it, because It’s such a pleasure supporting a man who - besides all his natural talents - never stops learning, improving his talents and doing everything he can to be the best man he can be! He amazes me every day with his passion, his gratitute and his humility. It’s an honor to be a Nick Carter fan! Thank you! !